On 3 June 2015, the United Nations General Assembly adopted a resolution officially designating 20 October 2015 as the second World Statistics Day, under the general theme "Better data. Better lives". In addition, the General Assembly decided to celebrate World Statistics Day on 20 October every five years. In the resolution, the General Assembly invites all Member States, members of specialized agencies, organizations of the United Nations system and other international and regional organizations, as well as civil society, including non-governmental organizations, such as research institutions, media and all producers and users of official statistics, to observe World Statistics Day. Statisticians and data users from Eastern Europe, Caucasus and Central Asia gathered in Chisinau, Moldova, for a two-day Workshop on Gender Statistics Dissemination and Training, organised by United Nations Economic Commission for Europe (UNECE) and UNDP Moldova and hosted by the National Bureau of Statistics. 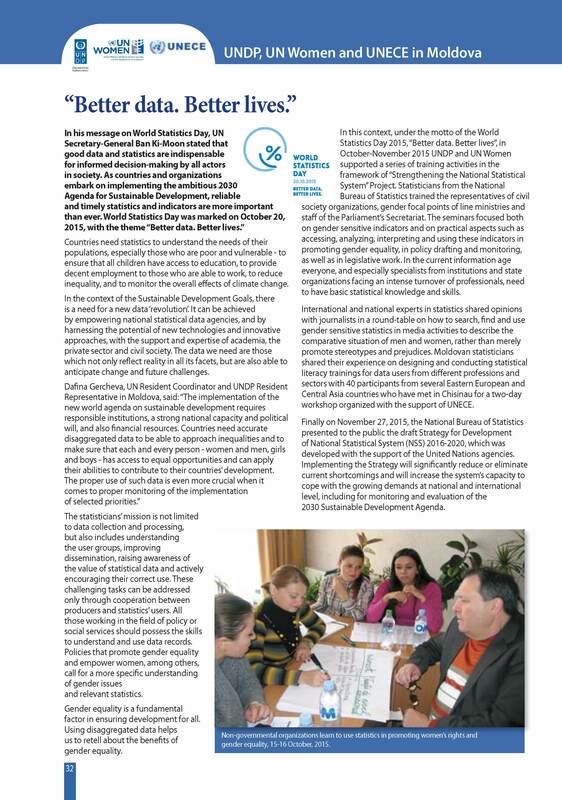 Tuesday, October 20th 2015, Republic of Moldova celebrated World Statistics Day. On the same occasion, the Academy of Economic Studies of Moldova and National Bureau of Statistics, with STATREG Project support, organized a conference themed "Better statistics for a better life". The conference "Improved local and regional statistics for a better life"
Tuesday, October 20, 2015, on the occasion of World Statistics Day, the National Bureau of Statistics (NBS) and the Academy of Economic Studies of Moldova with the support of the project "Improving regional statistics in Moldova" organizes conference "Improved local and regional statistics for a better life".